We Started this week by talking about the controversy that we caused with Episode 25 a few weeks ago. If you’re interested in the subject of Conspiracy Theories and GMO’s take a look at 2 of our favorite podcasts, You Are Not So Smart and The Skeptics Guide To the Universe. Ru also recommended looking up Kevin Folta, who through coincidence appears in the most recent episode of the Skeptics Guide. Ru and Harry mentioned how much they’ve been enjoying their Firewire Evos. We’re hoping to do a more detailed breakdown of the board in a future episode. First up in the news this episode is the Titans of Maverick’s contest which ran last week. Local Nick Lamb won the contest, and this highlight reel shows all the glory, or you can watch the full stream at Red Bull TV. We then moved on to get excited about the Eddie Aikau Contest which ran the day after we recorded, so we’ll do a full coverage of that event next episode. All this talk of big waves brought up a discussion about protective gear and an episode of Freakonomics Radio where they talked about concussions in the NFL. We then started talking about the SIMA Awards, and some of the winners, before moving on to talk about the scandal at Rip Curl that was exposed in a Sydney Morning Herald article. 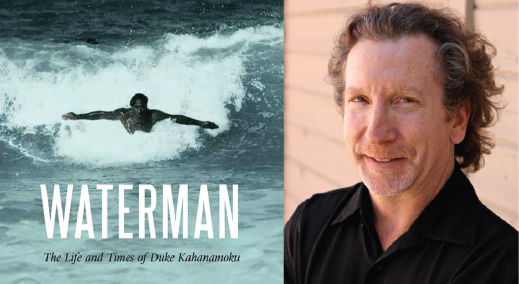 David Davis is the Author of “Waterman: The Life and Times of Duke Kahanamoku” which Harry recommended in our Christmas Gift Guide in Episode 22. The book is the first comprehensive biography of Duke Kahanamoku to be published, and our interview talks about several different aspects of Dukes life and what drew David to write about him. We mention some of David’s other work in the interview, including “Showdown at Shepherd’s Bush“, and if you enjoyed this interview, you should check out Surf Splendor’s interview with him. The subject his week is big wave legend Brock Little, who sadly died last week. You can watch the interview that Ru mentions on KHON’s website. Ru brought up this cool edit of Balaram Stack (not Dylan Graves) in Bocas del Toro in Panama. Last up was Harry’s suggestion of this Surfer Magazine video of Honolua Bay.